Everyone who has ever visited Greece, especially during summer, knows that Greeks like to party! They’ve always had! Greeks, being a religious people, wanted to honor their Saints and at the same time find a good excuse to skip work. That’s what a “Panigiri” is. Every village or town or even big City has a protective saint and on the day that commemorated this saint, there is usually a “panigiri” in their honor. Although not many people go to church regularly, it is a custom for locals to attend that joyous service. Summer tends to have many days in which a Christian saint is honored, and that means many churches and many villages around Greece dress in their best outfits and take great pride on that day. Same thing applies in Naxos. From 20 of May until September there are a dozen panigiri on the island, with the 15th of August festival, to celebrate the Virgin Mary the biggest! In the old days the whole village gathered outside their main church, in the village square and together prepared a feast for everyone. Men grilled and brought wine, women cooked and set the tables. The village welcomed people from all over the island and they greeted them by name, calling them to take a sit on the tables. After the main course (usually some kind of meat), local musicians started the entertainment part of the evening and by sunset, everyone was dancing and having fun. Not much has changed today. 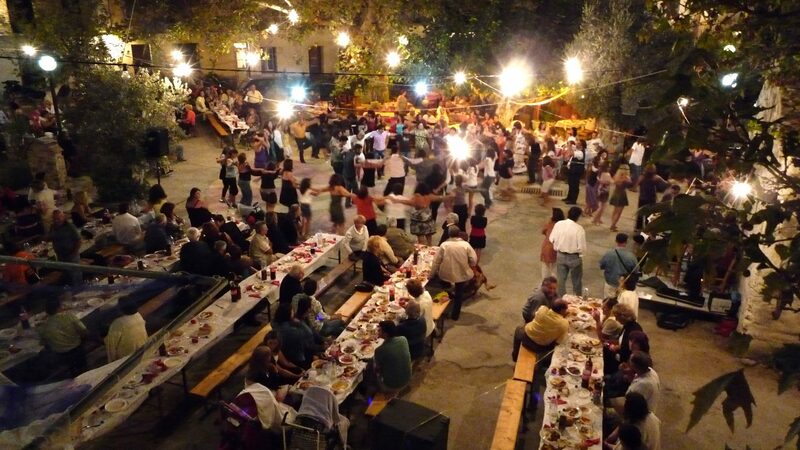 Although nowadays no one knows everyone by name, the local communities and municipalities still arrange for musicians to appear and may continue to offer free snacks (meze) on that day. Taverns join in the festive spirit and offer their guests local dishes and wine to enjoy! So if you’re planning on visiting Naxos in the summer, a panigiri is definitely worth the visit. Here’s a list of the most well known ones.